Dirt Devil ATV Tires - Review and Best Deals. The popular Dirt Devil tire. GBC Dirt Devil ATV tires are some of the most popular tires for sale today. When you look at the performance for the price,that's no big surprise. So let's dig a little deeper to see what these ATV tires really have to offer. But if you want to shop first, just click the link below. 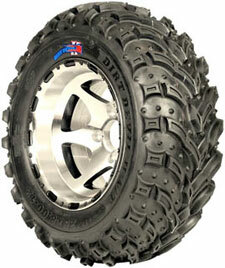 Dirt Devil ATV tires are GBC's top selling model for a good reason. They just happen to be one of the best all around tires you can buy - and they're value priced! If you need an ATV tire that works reasonably well in almost all terrain, comes in a wide variety of sizes, and won't trash your bank account - the Dirt Devil tires belong on your short list. When you ride in an area with a wide range of terrain like we do, you're going to need a tire that works reasonably well in all those conditions. We encounter everything from sharp edged rocks - to leaf covered loamy trails - to sandy river bottoms - to boot sucking mud .... all in the same day! Since you can't exactly change tires for every situation - good all-rounders like the GBC Dirt Devil tires are a necessity. They man not be the absolute best at any one thing - but they're pretty good in almost any type of terrain you would normally see. 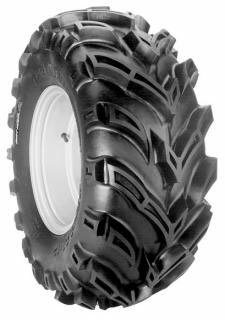 Throw in the fact they ride and handle well - have a six ply rating for decent puncture resistance - wear reasonably well - have that value price thing going - and these ATV tires are tough to beat! Dirt Devil ATV Tires - Video Test. You think those lugs on the popular A/T model Dirt Devil four wheeler tires look a little wimpy for you? Not so fast my friend! GBC has you covered with the X/T model. If you like to spend most of your riding time in the mucky stuff - and are willing to sacrifice a little ride comfort - the deep lug X/T ATV tires are for you. 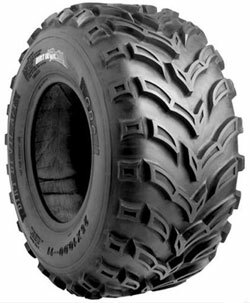 Still a very good all-round ATV tire, the X/T has the same lug pattern but with lugs almost twice the depth of the A/T. A side benefit of the bigger lugs is an increase in ground clearance of about an inch. Of course, they're a little heavier too, which can effect performance some. An updated version of the Dirt Devil ATV tires is called the Dirt Devil II. It comes in both a standard lug A/T version and a deep lug X/T as well. You'll notice this tire has some "spikes" between the lugs for even more traction on soft surfaces like mud, sand, and snow. The lugs along the tread surface are said to have a sharper "edge" for better bite in the soft stuff. The Dirt Devil 2 uses a different rubber formula for better traction and better puncture resistance and durability. Dirt Devil ATV Tires - Conclusion. Basically, if you need a tire that works well in most types of terrain, rides and handles well, has good puncture resistance and lasts a while - one of the Dirt Devil models should get the job done for you. The best all-purpose tire is the A/T which works fine on almost anything but really deep mud. If that's where most of your riding is done - opt for the deep lug X/T and never look back. If you want the very latest in tread technology and want to spend a few more dollars - take a look at the Dirt Devil II line. Click our custom link below for the best possible prices online today!